Any respectable cheeseboard is going to have an accompaniment that perfectly elevates your choice in cheese. At Pizzeria Via Stato, you’re going to find something a little more unique than your regular honey or jam. 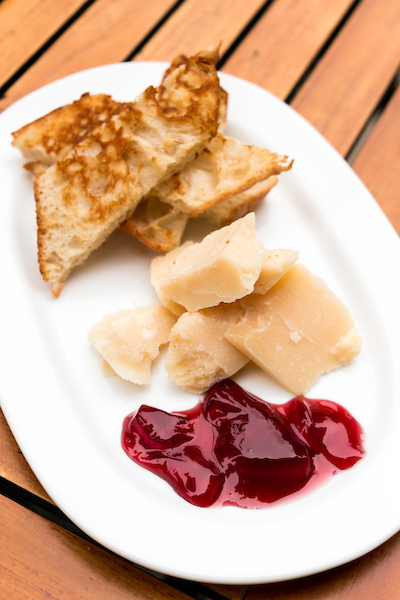 Chef David DeGregorio crafts his own wine jelly with Chianti and pairs it perfectly with a very salty Parmigiano Reggiano and grilled fresh bread. Chianti wine is used specifically for the flavor profile as it has a medium-body and is fruity, with flavors of cherry. That simple combination is something worth going out of your way for. The saltiness of a well-crafted Parmigiano Reggiano complements the subtle sweetness of the Chianti wine jelly in a really wonderful way. Let us know what you think after you make a reservation and give it a try. If your dream meal is a charcuterie board, we’ve got the how-to to make your dreams a reality.